It took me some time before I was game enough to tackle a butternut squash again, having battled one and lost some time ago. Armed with my largest knife and sharpest peeler, I attacked this guy and won! Roasted garlic and prosciutto add richness, salt and crunch to this butternut squash risotto, making it a fall favorite at our house. A little fresh sage goes a long way with me, so I tend to use it sparingly. I selected a sauvignon blanc from a local winery, Callaway Vineyards. Pour yourself a glass to enjoy while you pull together the risotto. 2. Peel the squash, cut into quarters, remove seeds and cut into 3/4 inch pieces. Place on large, sided sheet pan. 3. Separate the garlic cloves from the head of garlic and place in one corner of the sheet pan, separate from the squash. 4. Toss the squash and garlic with olive oil, salt and pepper. Roast in oven for 20 minutes. 5. Curl the strips of prosciutto into little rolls. Place in small baking pan and cook in the oven for 15 minutes. 6. After 15 minutes, the squash and garlic should be tender and caramelized and the prosciutto will be crispy. Remove both pans from the oven. Cover vegetables with foil. 7. In a medium-sized saucepan, heat the stock over medium heat. 8. Trim and wash the leeks, using only the white and light green portions. Cut the cleaned leeks into thin half circles. 9. In a large, heavy-bottomed pot, melt the butter over medium heat. Add the leeks and cook until tender, about 5 minutes. 10. Lower the heat to medium-low. Add the rice and stir to coat with the butter-leek mixture. Cook for about 3 minutes. 11. Add the wine, stir and cook until most of the wine has been absorbed by the rice. 12. Add 2 large ladles of hot stock to the rice and cook, stirring, until most of the liquid has been absorbed. Repeat procedure until all the stock has been added to the rice. Mixture should be creamy rather than soupy. Turn off the heat. 13. Mix in the Parmesan. Taste and correct seasoning. 14. Add the squash to the risotto. Remove the garlic from the skins, chop and add to risotto. Stir to combine well. 15. Roll 2 sage leaves into a cigar and slice thinly. Stir into risotto. 16. Serve the risotto and top each portion with several of the crispy prosciutto “roll-ups”. 17. Garnish each portion with an additional sage leaf or two. I have a squash sitting on my counter now I know what I’m going to do with it. This is such a lovely fall recipe. I like your idea of adding prosciutto! The salty crunch really makes the dish, I think – thanks, Lynda! 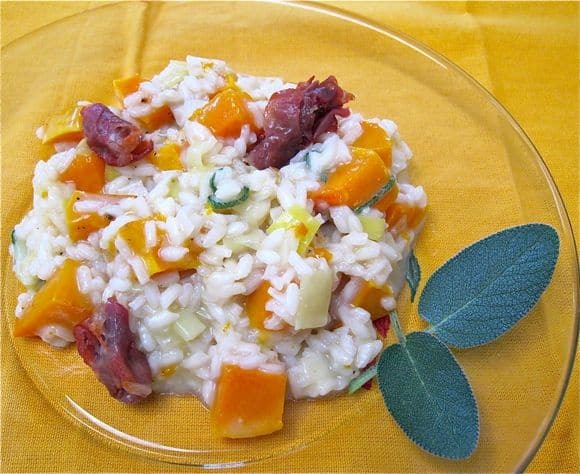 I just love risotto and squash. This is comfort on a plate. Bacon is a great touch. Yummy! Thanks for visiting – have a great day, Elizabeth – eager to hear all. Having an excess of roasted butternut squash, I made your recipe tonight…we loved it! This is a great recipe. I love that I am looking at your family every time that I log on to your blog. You are part of a great tradition of women who love to cook and who love life. Thanks, Mare. I realize that after all our chatter, I don’t know much about your roots – we can chat more later…BTW, have 3 dinner party menus for just Larry and me to pair with your lovely wines. One will be short ribs, another leg of lamb and then a French beef stew. Thanks – I’m impressed by your homemade pancetta!